"July 30th will see another international musical event called the “Loud Festival” to be staged at the Putra Indoor Stadium Bukit Jalil at 8pm. With Asia’s King of Pop Jay Chou leading the light, will be backed with the best line up including the much-anticipated band Soda Green, Landy Wen and Cindy Yen, all attempting an incredible and ecstatic performance unleashing new works, new sound and new experiences for the audiences! Malaysia being the first stop of , it is going to be a 2-hour show that unfolds great entertainment value. Besides the rendition of best-known songs by each artiste primarily Jay Chou and Soda Green, the show underlines some amazing remakes of crossover arrangement and duet performance by the artistes. Jointly organized by Unusual Productions and Star Planet, this upcoming is anticipated to create yet another ‘Ticket Buying’ craze! Being acclaimed as one of Asia’s best selling recording artistes Jay Chou continues his reign in the Mando-pop world and has a great influence over the young generation. The undisputed Taiwanese king of R&B recently celebrated his 10 years in show biz with magnificent sell-out shows themed “The Era” World Tour across the globe. Soda Green, a Taiwanese independent folk-rock-pop band emerged in the Taiwanese indie music scene after receiving the Grand Jury Award in the Hohaiyan Gongliau Rock Festival in 2004. In 2006, the band received nominations for the Best Music Arrangement and Best Band awards in the prestigious 17th Golden Melody Awards. The band is especially prominent for its main vocalist-songwriter Qing-Feng, who stands out with his unique literary, performing style and wide vocal range. Landy Wen is one of the few Taiwanese aborigines to become a musical star well-loved for her rich vocal, energetic dance actions and exhilarating showmanship. Whereas, Cindy Yen, a multi-talented Taiwanese singer is beyond dispute a newcomer with firm music talent & her arrival in the music industry has already created a huge stir! Her debut album is mainly built upon R&B, spiced with popular elements such as rock, metal and electronics. The ticket launch for has been scheduled on 14 May. Tickets are priced at RM488 (VIPA), RM388 (VIPB), RM328 (PS1), RM228 (PS2) and RM148 (PS3). 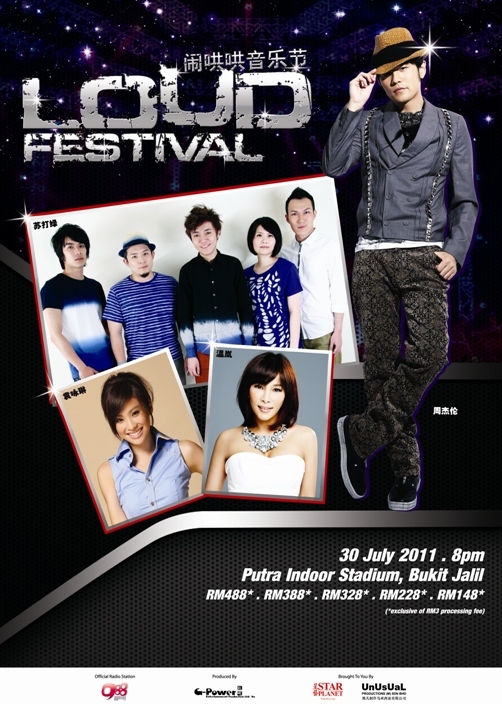 For tickets, call Star Planet 03-92233667, TicketCharge 03-92228811 or visit www.starplanet.com.my / www.unusual.com.sg / www.ticketcharge.com.my"
《Loud Festival 闹哄哄音乐节》门票将于5月14日全国公开发售，您可透过Star Planet 办公室或 TicketCharge 指定授权销售柜台购票，除此，您也可通过网站选购门票。任何有关演唱会详情，可拨电至星艺娱乐办公室0392233667或TicketCharge 03-92228811 或浏览www.starplanet.com.my/ www.unusual.com.sg / www.ticketcharge.com.my"
"Loud Festival tickets selling are launching on 14 May 2011. Are you ready to get some tickets?" Received this notification on SMS and Facebook. Seems like they are doing BIG promo this time. Good to see Jay Chou bring along Soda Green and two female artist along for the concert. I believe it will be another blasting concert after “The Era” World Tour.